Hi friends, how have you been? Not even going to lie. It's been a rough few weeks around here. It seems like my entire crew has been on a non-stop merry-go-round of sickness for the past two months. Just when we seem to be kicking one cold/flu bug to the curb, we pick up another! I've been on 24/7 germ control, and apparently, I've been failing miserably. Alas, I'm trying friends, so hard. The last few days haven't been quiet as bad (knock on wood) so I've been doing a little therapeutic baking. 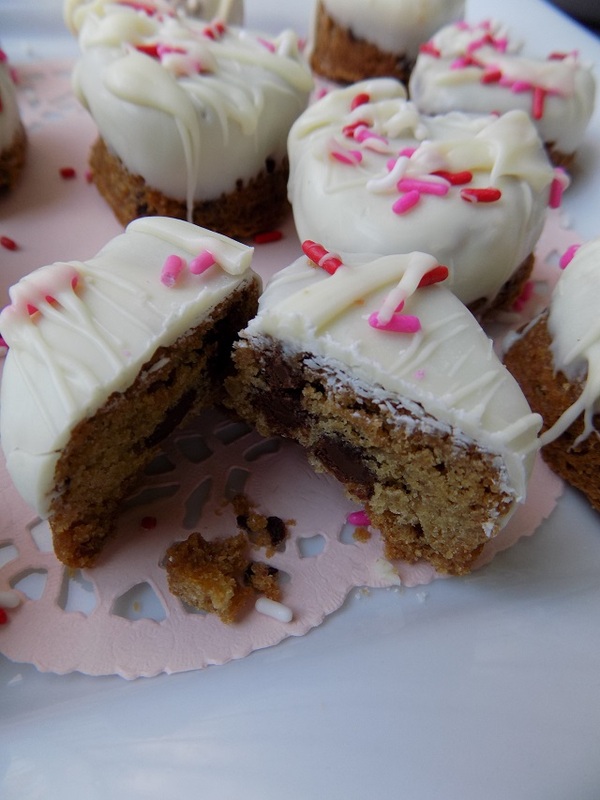 Chocolate chip cookies, especially deep dish chocolate chip cookies like these ones (in heart shapes, covered in white chocolate and Valentine's sprinkles) bring on the smiles around here. They were just what the doctor ordered! They are delicious, and they're so easy to make too. 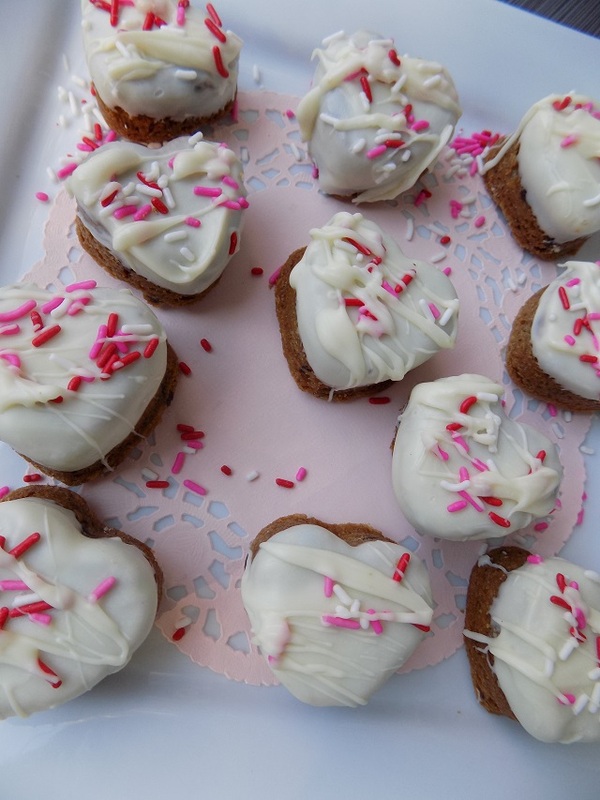 They're the perfect DIY sweet treats to share with loved ones for Valentine's Day, or any day. You can make them gluten-free or regular, your choice. Both are equally delicious! 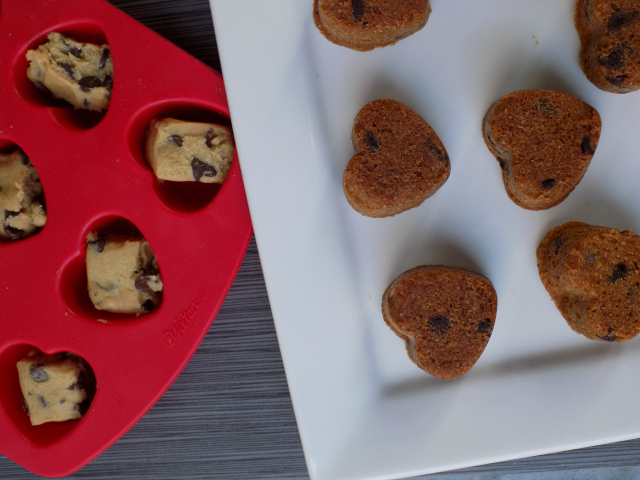 Grab my recipe for Gluten-Free Deep Dish Chocolate Chip Cookie Bites, below. Recipe yields: About 24 Deep Dish Chocolate Chip Cookie Bites (using my recipe for gluten free chocolate chip cookie dough). 1 silicone candy / baking mold. We found the heart mold (made by Wilton) at our local craft store. You can use any mold you'd like so long as it's heat resistant/can be placed in the oven at 350 F. and has spaces that are about 2 inches deep x 2 inches wide. Melt butter in a saucepan on low heat. Set aside to cool for 10 minutes. While butter is cooling, combine gluten free flour, cornstarch, xanthan gum, salt, and baking powder, in a separate mixing bowl. Once cooled a bit, add brown and white sugar to the melted butter. Cream/combine mixture with a hand mixer. Add milk, whole egg, egg yolk, and vanilla extract. Mix on medium speed until combined well. Slowly incorporate the flour mixture until combined well. Fold in semisweet chocolate chunks by hand. After the dough has chilled, preheat your oven to 350 degrees F.
Roll out your cookie dough, and round into 1 1/2 inch balls. Place each rounded ball into one of the spaces in the silicone chocolate mold/baking mold. Set the silicone mold on a cookie sheet and bake for 12-14 minutes (until golden brown). Remove from oven. Allow cookies to cool for 2-3 minutes, then place them (still in the mold) in the refrigerator to cool completely for 1 hour. Carefully remove your cooled chocolate chip cookie bites from the silicone mold. Set aside. Melt down white chocolate in a microwave safe container. Melt on defrost setting in 30 second increments (stirring chocolate in between) until the melted consistency is smooth/lump free. Dip the tops of your gluten free deep dish chocolate chip cookie bites into the chocolate (covering the top half of the cookie bites). Gently shake excess chocolate. Set cookie bites (right side/chocolate covered side up) on a baking sheet lined with wax paper. Repeat this step until all of your gluten-free deep dish chocolate chip cookie bites are covered in white chocolate. While chocolate is still wet, sprinkle with Valentine's Day themed sprinkles / sprinkles of your choosing. Allow chocolate to dry/set for 15-20 minutes before serving / wrapping for storage purposes. These cookie bites store well in an air tight container for 3-5 days. Happy baking & Happy Valentine's Day! That looks way too sweet for me, but I know just the person (my friend!) who would love these!